Summer is fast approaching and our roof gardens and outdoor spaces are beckoning. Such spaces offer an area for relaxation and entertainment, yet with all the outdoor furniture options available on the market, making the right choice involves some thought. 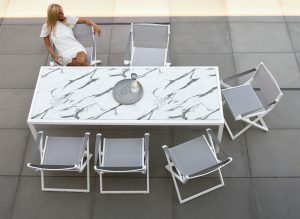 Our team at Brands International – popular suppliers of home and garden furniture in Malta – wanted to share a few reasons we love 10DEKA outdoor furniture. Style and comfort are key when designing any space. 10DEKA offers a vast range of sophisticated colour choices and finishes, both in the structures’ frames and fabrics. Whether you’re going for a marble-look finish or a luxurious Greek island resort aesthetic with brilliant white or Aegean light blue; all 10DEKA fabrics and finishes lend the space an air of elegance. Characterised by its minimal design and clean lines, 10DEKA furniture is the epitome of crispness and style. From dining tables to daybeds and double sun loungers, 10DEKA comes in a plethora of shapes and modular sets to suit your design aesthetic. 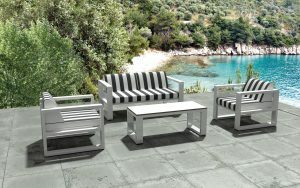 At Brands International, we choose 10DEKA as part of our stock of garden furniture in Malta as all 10DEKA models are lightweight yet sturdy, and our materials are tested in the Greek climate, very similar to that of Malta’s. Our high-tolerance aluminium frames ensure durability in all kinds of weather conditions and environments, be it next to the waves or exposed to heat and winds, which can send non-sturdy furniture flying. The aluminium we use is also chemically-treated to protect against corrosion, allowing for a longer life. Moreover, the variety of fabrics used in 10DEKA collections are also specifically chosen and treated for outdoor use. To name but a few, we offer high-performance artificial leathers, Textylene fabric (a woven PVC-coated polyester that is flame retardant, waterproof, fade and mould resistant), as well as Acrylic fabric (100% recyclable, rot-proof, protects the skin by blocking more than 97% of UV rays and is finished with NUVA© water-repellence solution). In case we didn’t have enough reasons to like this brand, the materials that make up 10DEKA designs can be maintained with minimal cost and effort. Due to our materials’ water resistance, suntan oils and lotions, for instance, can be removed from all fabrics using mild soaps and warm water, without the need for harsh chemicals. HPL (High Pressure Laminate), another material used in 10DEKA, is also easy to maintain and can therefore be used in many applications. It is resistant to climatic shock, UV light, staining, scratching, abrasion and chemical attack, which means little to no maintenance and a longer lifetime. 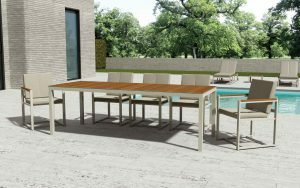 10DEKA outdoor furniture combines a perfect blend of innovative design, comfort and functionality. Come over to Brands International to view our vast range of outdoor furniture. We offer a complete home-finishing solution under one roof, making us the best choice for home and garden furniture Malta has to offer! Be sure to follow all of our latest updates and offers on Facebook and Twitter.